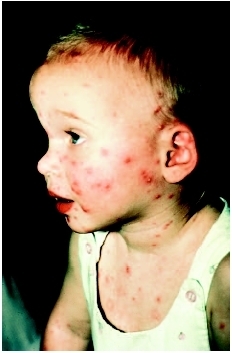 Child with chickenpox on the face and chest. used to treat the disease among the general population, especially in children, is controversial. Arvin, Ann M. "Varicella-zoster Virus." In Principles and Practice of Pediatric Infectious Diseases , 2nd ed. Edited by Sarah S. Long et al. St. Louis, MO: Elsevier, 2003. "Chickenpox." MedlinePlus. Available online at http://www.nlm.nih.gov/medlineplus/chickenpox.html (accessed December 25, 2004).